The texture of Balkind's skin was a mixture of satin and silkiness. A dense pewter coloured fur covered his neck and head, which shimmered in the sunlight as his eyes darted from Frankie, to his master, then to Bally, breathing in the unique scent of each of them. Two barley sugar horns protruded from his head, and his gossamer wings were almost invisible against his flanks. His tail thrashed from side to side. That he was pleased to be amongst friends again was obvious. Frankie turned to the stranger. The man looked at her, his strange blue eyes filled with scorn. 'Yes of course. Just one tear could bring this bone back to life.' Then he tossed the bone to Balkind, who caught it in his jaws. 'Don't mess with me!' Frankie warned – wishing she were a knave – She'd knock that silly smile off his face double quick! The man ignored her. Feeling about eight years old again, Frankie turned her attention to his griffin. In a similar fashion to Bally, Balkind held the bone steady with one fearsome looking talon while he crunched it down in two bites. His floppy upper lip curled backwards, displaying long canine teeth also similar to Bally's. Bally watched the bone disappear, he looked confused, as though to say where'd it go? Then he nudged at the rucksack, giving hopeful glances up to his new human friend, who was obviously thinking the same as Frankie. 'Balkind and Balkin.' He mused, as Balkind ducked his head and placed his nostrils against Bally's broad head, sniffing as though he could eat the smell of dog. 'Balkin's short for Ballykinny Lad. We call him Bally for shorter,' Frankie explained. For years Michael had wanted a dog, comparing breeds and taking on extra newspaper rounds, and never missing a chance to bore anyone who cared to listen about what he was going to call his dog, and the hikes they'd have over mountains and wild places. Canine Balkin snapped at griffin Balkind's nose, and with a final snort of disgust, Balkind whipped his head away, swivelling on that long muscular neck, and, without warning, thrust it into Frankie's chest. Automatically her arms went up, and she found herself stroking, burying her finger tips in velveteen fur. She found his soft spot, right between the barley sugar horns, and knuckled the spot there. His eyes closed with bliss and a deep rumble shook his body, deepening until it shimmered against Frankie's bones. 'He's purring.' Her arms were beginning to ache. Shaking his head but still smiling, the stranger scratched the side of the griffin's neck where it emerged from his shoulder, and with a sort of collapsing at his knees, Balkind fell to the ground. Frankie half expected him to roll over onto his back. Frankie wondered just how many griffins he owned, and if he'd used the "Royal We" or if there were more like him back home, but more importantly, she wanted to know more about this "special diet". Frankie continued stroking, and the rumbling purr started up again. With a grunt, Bally laid his head on the stranger's knee, and they could have been any ordinary couple out for a walk with their dog. And griffin. 'Mainly sixteen year old maidens.' He teased. Frankie reached across and punched him. 'Joker? Oh – jester.' He seemed amused and content to just sit there, shooting the breeze. 'Didn't you try this morning?' He didn't answer, but his silence spoke for him. Reaching over, he chucked Frankie under the chin, as if to say "friends again? ", dropping his hand to stroke Balkind, now half asleep. And in that moment, for the first time Frankie believed in him. Until then, she'd been sub-consciously waiting for the punch line – half expecting the eager beaver director of this crazy reality show to jump out and confess to an elaborate prank. She felt incredibly sorry for him, and incredibly amazed at his bravery. Frankie considered this, and it seemed to make sense. 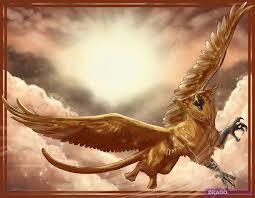 She sat there, stroking a griffin's head, making small talk with some other-world-er, and it seemed to make sense. She felt more at ease with this stranger than with Annette, for some reason. Apart from the hollowness in her stomach, she could sit here all day. The afternoon sun shone down, and Frankie slowly rehearsed in her mind the questions she wanted to ask her new friend. A great extract from a great book! Don't we have great taste! !